The exhibition ran until 13th Jan 2019. It is available for use elsewhere. Just contact us! In Catlin’s Cafe at Venue Cymru (the site of Will Catlin’s Arcada) you will find an Exhibition on the Will Catlin’s Pierrot troupes that were the talk-of-the-town and major tourist attraction in Llandudno from the 1900s to the 1950s. This exhibition of posters, costume, hand-cranked what-the-pierrot-saw machine, will inform you and inspire you about the recent -but-forgotten history of pierrot and concert parties that were the staple delight and main entertainment for hundreds of thousands of visitors to Llandudno. Live entertainment by these troupes were the daytime and evening mainstay of entertainment at the seaside – with songs, dances, sketches and some contemporary satire this was the Entertainment: show-business, glamour, frolic and folly, fancy and frivolity, silliness and serenading. 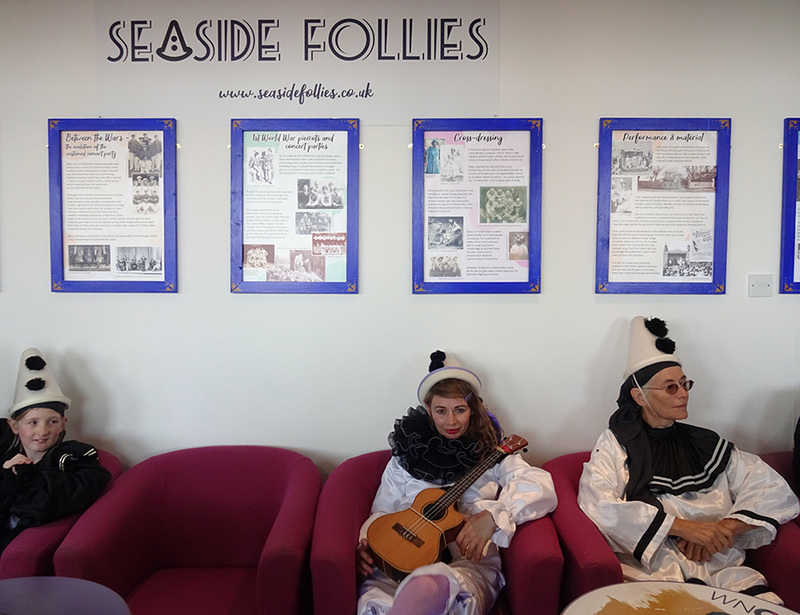 Seaside Follies are on a mission to bring back the pierrots and good old Live Entertainment.